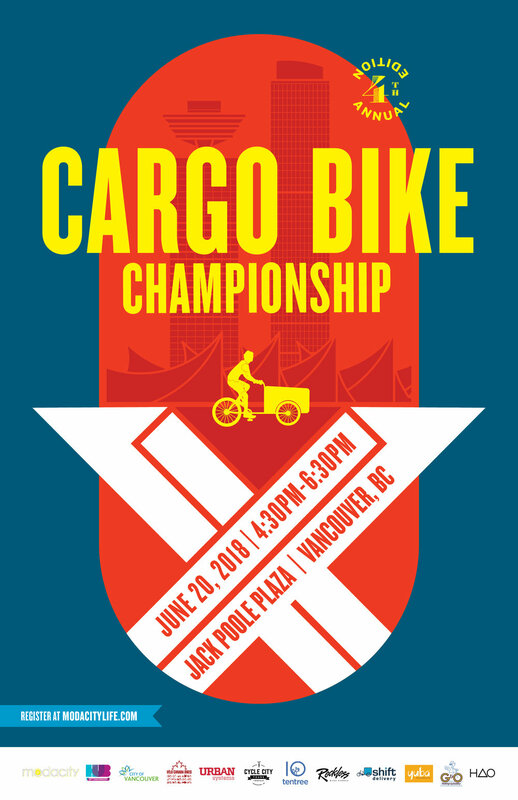 You are cordially invited to join us on the afternoon of Wednesday, June 20th, 2018 for Vancouver's 4th Annual Cargo Bike Championship. The event will take place during HUB’s ‘Bike to Shop Days’ Media Launch in Jack Poole Plaza from 4:30pm to 6:30pm, where we will be racing longjohns and longtails of all shapes and sizes, with a chance to win some great prizes. Through the generous support of the Vancouver Convention Centre, we have secured a “closed” oval, with multiple cargo bikes racing at the same time, all with the Olympic Cauldron and North Shore Mountains as our backdrop. We are asking entrants to register for the event, with a small fee to cover administrative and venue costs. Participants must complete the Release and Waiver form, and return to the organizers prior to the event date. We are also offering a number of limited edition T-shirts featuring the beautiful poster art. For anyone simply wanting to observe the action, attendance is totally free and most welcome. There will even be a number of local bike shops and cargo bike manufacturers on hand to display and offer test drives of their products. This event would not be possible without the ongoing support of our amazing partners and sponsors: HUB Cycling, The City of Vancouver, Vélo Canada Bikes, Cycle City Tours, Reckless Bike Stores, Shift Delivery, Yuba Cargo Bicycles, G&O Family Cyclery, HAO Creative, tentree, and Urban Systems. Deadline for registration is Monday, June 18th, 2018 at midnight.